There was an article in yesterday's Times Union (front page and above the fold, I'm told) about Redburn Development's next project: "Developers plan to buy five downtown Albany buildings." 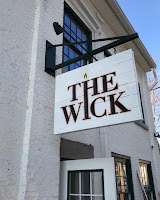 Redburn Development--Tom Rossi, John Blackburn, and Damien Pinto-Martin--is the group that created The Wick Hotel on Cross Street. They are also one of three developers that have submitted proposals for the former Kaz warehouse site. 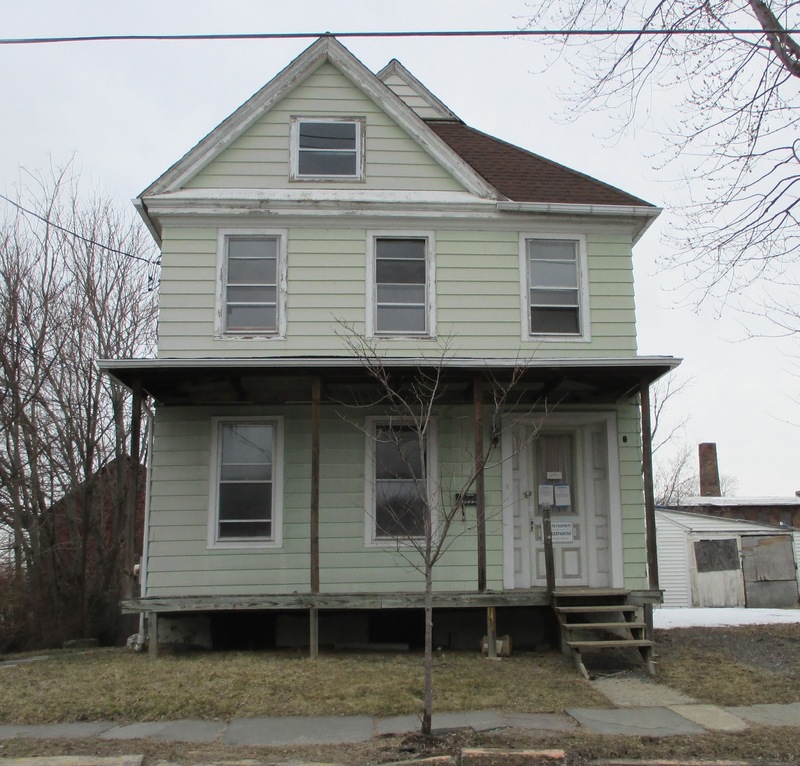 Those three proposals will be discussed in a special meeting of the Hudson Development Corporation Board to take place on Wednesday, April 4, at noon, at 1 North Front Street. 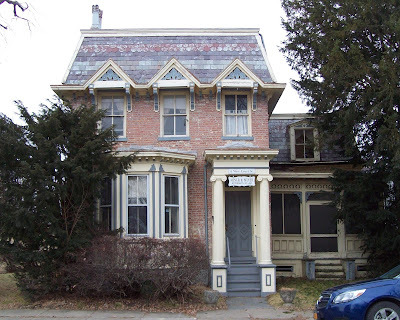 At its meeting on March 15, the Common Council Economic Development Committee, on the suggestion of Council president Tom DePietro, decided to kick the Stewart's proposal for a zoning change to enable the expansion of the Stewart's at Green Street and Fairview Avenue over to the Legal Committee. This past Thursday night, the Legal Committee took up the issue. Although the discussion of the subject, as it bounces from one committee or regulatory board to another, tends toward exasperating redundancy for someone who has been following this for more than a year, there are some new developments to report. First, Alderman John Rosenthal (Fourth Ward), who chairs the Legal Committee, was in receipt of a letter from Jeff Hunt, president and CEO of the Columbia County Chamber of Commerce. Purporting to speak "on behalf of the Board of Directors and the over 700 members of the Columbia County Chamber of Commerce," the letter declares support for Stewart's expansion, "whether it's achieved by a simple use variance or by way of the adoption of an Overlay District proposed by the Stewart's Corporation"--in other words, by any means necessary. Our support for the expansion is twofold, as a Chamber of Commerce, we generally support industry and business expansion because in general it increases our tax base (property, sales and gas taxes), creates and expands employment opportunities and finally the expansion encourages a safer pedestrian pathway to Hudson. 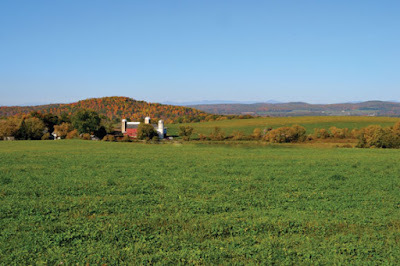 Additionally, based on the merits of the Stewart's application the Chamber supports the Overlay district because of its goals are in line generally with what many of citizens of Hudson has been asking for. Those goals include the following: Requiring new mixed use developments in future developments, create a 5 minute pedestrian commute to the City of Hudson, establishes a standard of appearances for new developments and encourages more sidewalks and a safer corner for pedestrian traffic. 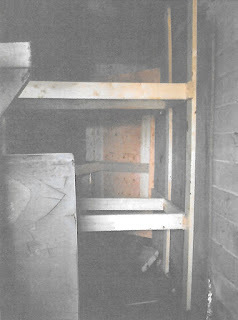 Hunt goes on to dismiss concerns about the demolition of two houses and consequent loss of six or seven dwelling units with this sentence: "The housing stock that has caused some to think negatively about the expansion is being replaced just a few feet up Fairview Ave by new clean, safe and affordable housing units." The reference, of course, is to this building, which is finally nearing completion after being under construction for close to four years. Chuck Marshall of Stewart's Shops also submitted a letter--his addressed to Council president Tom DePietro and the members of the Common Council. The letter asserts that Section 325-40 of the city code allows individuals to petition the Common Council for zoning amendments, outlines the community benefit of a larger store ("a brighter, more pleasant shopping experience"), talks about community wealth ("Employees of Stewart's Shops have the potential to become stockholders so we don't refer to them as employees for "Partners"), and argues that the Council should accommodate Stewart's because it amended the list of conditional uses in the R-S-C (Residential Special Commercial) district on the south side of the city to include hotels and allow The Wick Hotel on Cross Street to be developed, adding this comment: "Unlike 'The Wick,' Stewart's has not nor will it seek a Payment In Lieu of Taxes [PILOT] associated with its redevelopment." The letter accompanied a draft for a host community benefit agreement, in which Stewart's promises, in exchange for the City adopting Stewart's proposed Green Street Overlay District, to give the City an undetermined amount of money for "the design, permitting and construction/installation of new pedestrian access at the intersection of Green Street and Fairview Avenue." 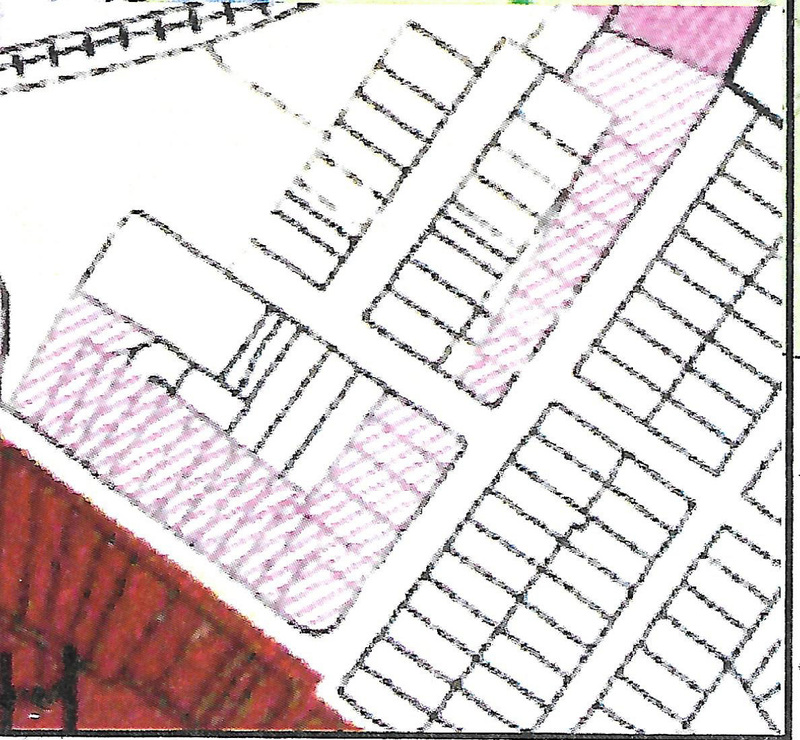 The proposed Green Street Overlay District would allow commercial enterprises as a conditional use in the area marked with magenta stripes on the map above. The proposed district would extend from just east of The Rosery on Green Street, wrapping the corner, to just south of ProPrinters on Fairview Avenue. During the discussion at the Legal Committee meeting, city attorney Andy Howard reminded the aldermen, "Something is designated a nonconforming use with the notion that eventually it will go away." He also counseled them, "You have to ask how important is that service to the residents of that area." 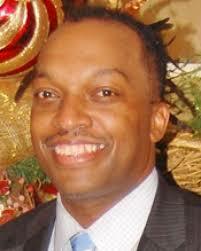 Responding to Howard's statements, Marshall told the group, "If Stewart's is unable to expand, it is our intention that we will eventually leave. 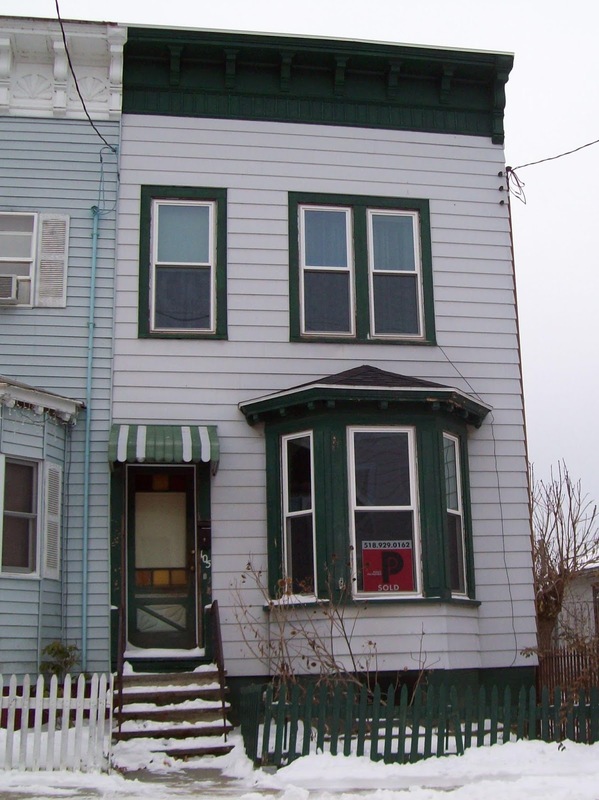 We could sell the building to another operator, but you would still have a nonconforming use on that corner." 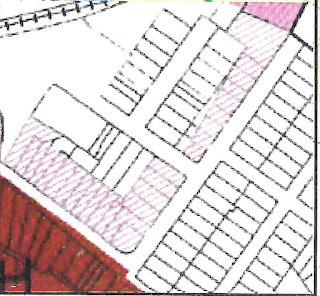 Howard outlined the Council's choices: they could find Stewart's proposal for a Green Street Overlay District acceptable as proposed; they could modify it; they could declare it unacceptable. He then posed the question: "Do we feel this would be appropriate and would not run afoul of a larger vision for the city?" The committee decided to take another month to think about it. 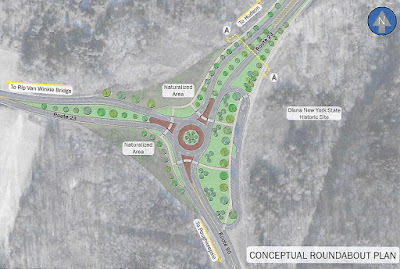 It's been a week since the NYS Department of Transportation held an open house to display the conceptual drawings for the roundabout planned for the intersection of Routes 23 and 9G. The morning after that event, the internet was awash with images of the roundabout, so Gossips decided not to be just one more report. Last night, however, I was reminded that people really do rely on Gossips to provide information they need and want to know, even when it is readily available elsewhere. For that reason, here is the conceptual plan for the roundabout that was on display last Thursday. A video created by DOT showing the roundabout in use, with vehicles zipping in and out of the circle, can be viewed here. Correct safety deficiencies using cost-effective accident reduction measures. Design approval will happen in April 2018; construction will start in August 2018; and the project is expected to be complete in December 2018. Here's a bit of information that's not easy to find: the Mayor's Housing Task Force, created by Mayor Tiffany Martin Hamilton in 2017 and tasked with developing "near-, mid-, and long-term actionable solutions" for Hudson's perceived housing shortage and with building "community consensus for solutions via ongoing, transparent communication and inclusive outreach," is meeting today, March 30, Good Friday, at 1 p.m. 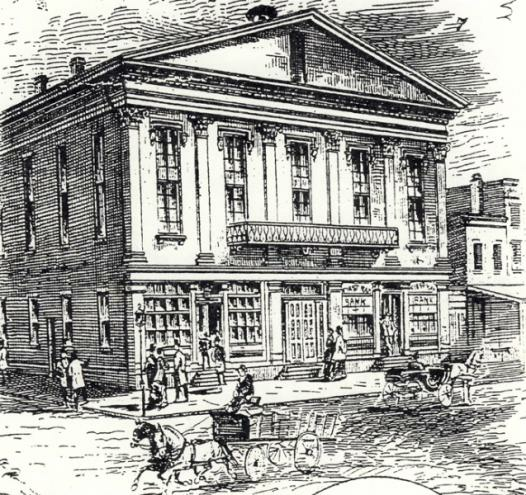 The meeting takes place at 1 North Front Street. On Monday, the Register-Star had an article on the statistics that show Columbia County has lost population during the period from 2010 to 2017: "Neighbors react to census data showing population decrease in Greene and Columbia counties." This evening, WAMC reported that Saratoga County was fastest growing county in New York: "Business Leaders Discuss Strong Saratoga County Economy." Here's a quote from that report: "Over the decades the county has transformed from a largely rural one with a vital summer tourism season to a home for a large high-tech economy and fast-growing suburbs." 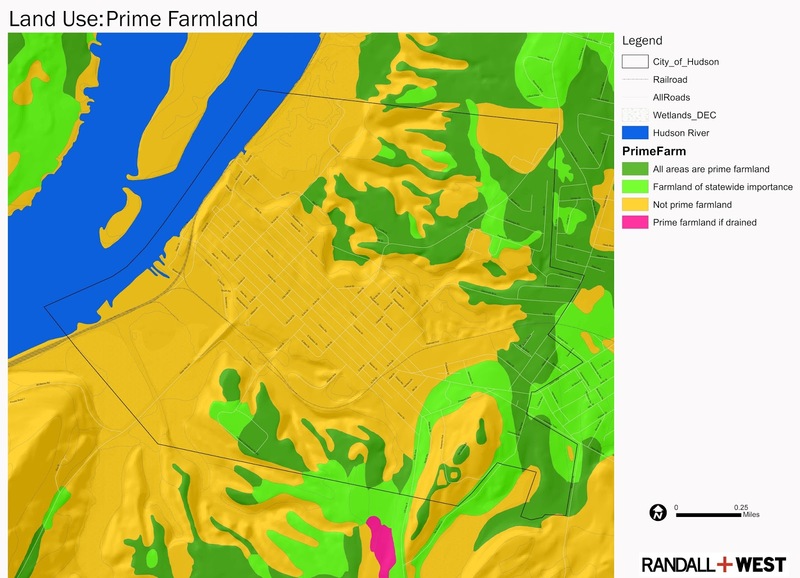 Farmland to suburbs--is that really a future we would want for ourselves? Last Saturday, the third Classics on Hudson concert, To Lenny with Love, took place at Hudson Hall. A group of twenty from the Capital District Patriot Flight veterans association were part of the audience. 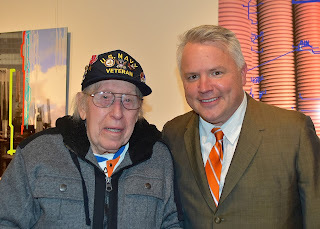 Among that group of twenty was Ralph Avery, a 93-year-old decorated World War II veteran and Hudson native who is also the great grandson of Peter Avery, the architect who in 1855 designed Hudson's city hall, now known as Hudson Hall. Avery, a navy gunner aboard the LCT 571 in World War II, was in the first wave during the invasion of Normandy at Omaha Beach on D-Day, June 6, 1944. His most recent honor for his wartime service was the French Légion d'Honneur, one of the world's most prestigious decorations, established by Napoleon Bonaparte in 1802. Saturday was Avery's first visit to the building his great grandfather designed since the restoration was completed. In the picture above, he appears with Sergeant Major Robert McDonald, a member of the U.S. Army Chorus, who was one of the performers in To Lenny with Love. The insurance agency SDL+GHS announced yesterday the creation of a scholarship for 2018 graduates of Hudson High School. The SDL+GHS Scholarship for Health Sciences provides assistance to outstanding students preparing for careers in the health care workforce. In announcing the scholarship, SDL+GHS said: "Every day we see firsthand how layered and nuanced the health care industry is, but also how essential every position is within that stratum. So whether you want to be a nurse, a pharmacist, policy maker, or public health professional, we want to help you realize that goal." One scholarship will be awarded each year. The deadline for applying is just two weeks away, on April 12. Click here for more information about the scholarship and to complete an application. The defacing of the rock wall along our waterfront is well underway. 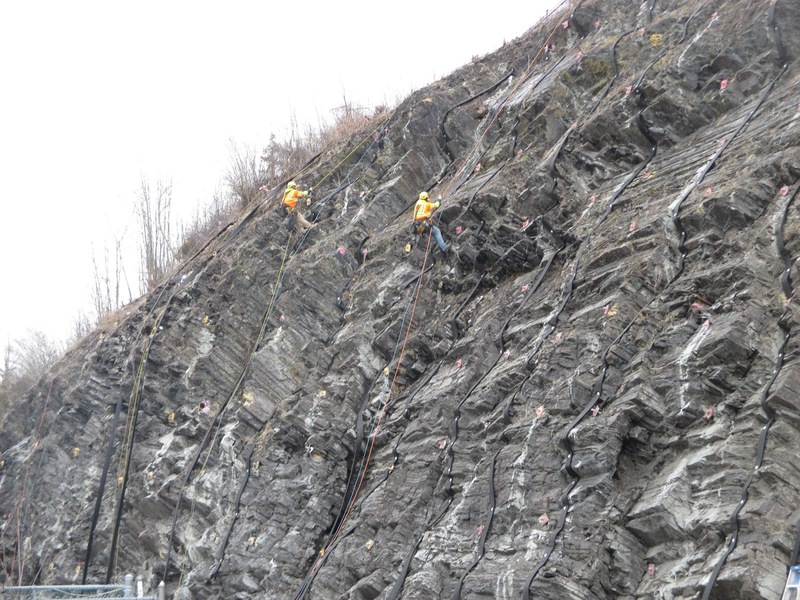 Straps are now being installed over the rock face, from top to bottom. 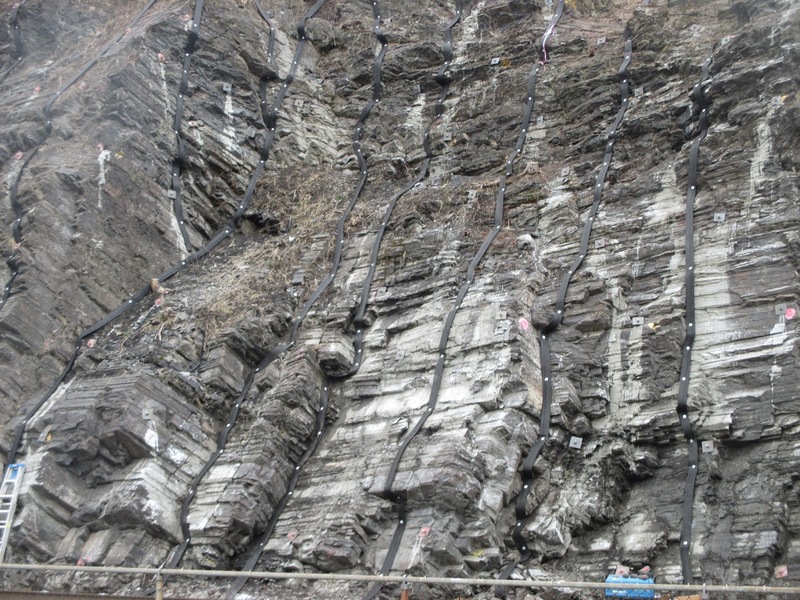 It appears the straps are meant to hold the rock in place. 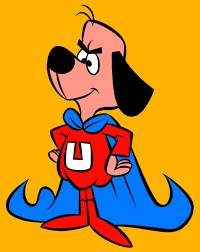 Remember when Mayor William Hallenbeck announced with great fanfare that Hudson was to be "the only municipality statewide to be exclusively powered by wind energy" and called on other municipalities to follow Hudson's lead? The transition to wind energy was expected to save the City $40,000 a year. And remember when it was discovered that the mayor's bold initiative, far from saving the City $40,000, had increased the City's electricity costs by $113,782 in the first year? That fiasco was brought to us by Viridian Energy LLC. Today, the following story was being reported about Viridian in Massachusetts: "Electricity Supplier to Pay $5 Million to Settle Claims of Deceptive Sales Tactics and Overcharging Customers." 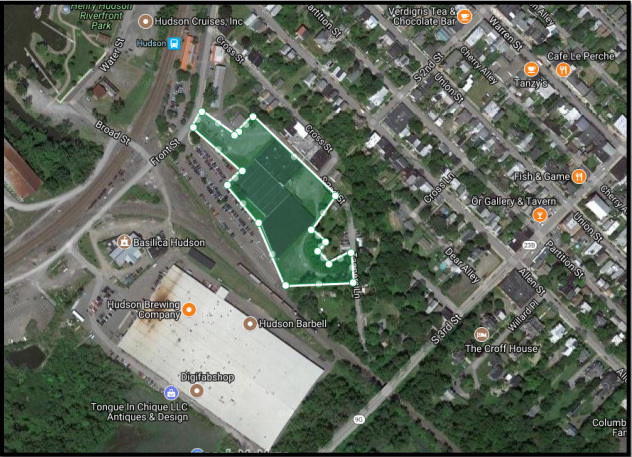 Two months ago, Gossips reported that the board of HDC (Hudson Development Corporation) expected to have chosen a "preferred development partner" for the Kaz site by March. March is now as good as over, and no decision has yet been made. Yesterday, at the HDC board meeting, Sheena Salvino, HDC executive director, told the board that she and the subcommittee tasked with assessing the three proposals submitted and the developers who submitted them--Redburn Development, Kearney Realty & Development, and Bonacio Construction--now were ready to "codify the results and make a recommendation to the board in a special meeting." That special meeting was set for Wednesday, April 4, at noon. After some discussion of the need to notice the meeting, HDC board member Duncan Calhoun asked, "Will we have this meeting and go immediately into executive session, because it's a real estate deal?" Common Council president Tom DePietro, an ex officio member of the HDC board, objected, saying the meeting should not be conducted in executive session. Seth Rapport, newly elected to the HDC board, explained, "Financial details may be mentioned," which would justify executive session. DePietro protested, "Financials are only one small piece." HDC board member Don Moore suggested the board ask its attorney for an opinion. At the end of the meeting, when the public was invited to comment, Gossips, the only representative of the public present, asked the board if it was not possible to structure the special meeting in such a way that what the developers had proposed in response to the RFP could be shared with the public before the board started discussing the particulars that required executive session. This appeal inspired additional discussion among the members of the board, and it was finally agreed that each of the developers would be asked to prepare a one-page abstract of their proposal to be shared with the public. It was stressed that the three proposals were all conceptual and nothing in any of them was concrete. Once a developer is chosen--a choice to be made by the HDC board based on a number of different factors--the public engagement phase begins, which will determine what specific things will be included in the project and what the project will look like. Mark your calendars. For those eager for information about this project, which will have a significant impact on the character of the city, next Wednesday, April 4, is your first chance. 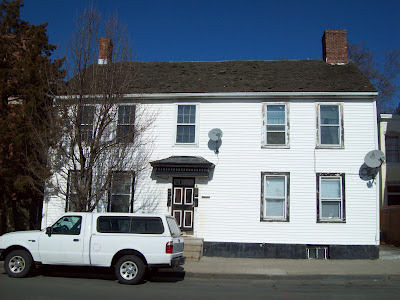 The meeting takes place at noon at 1 North Front Street. 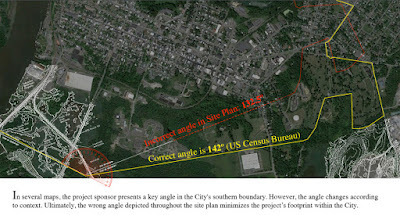 At the informal Common Council meeting on Monday, March 12, a group called East Light Partners made a presentation to the Council about a solar farm they are proposing to build in nearby Greenport, on Vapor Trail, on a site they characterized as "not land in agricultural production," next to a factory and next to a prison. 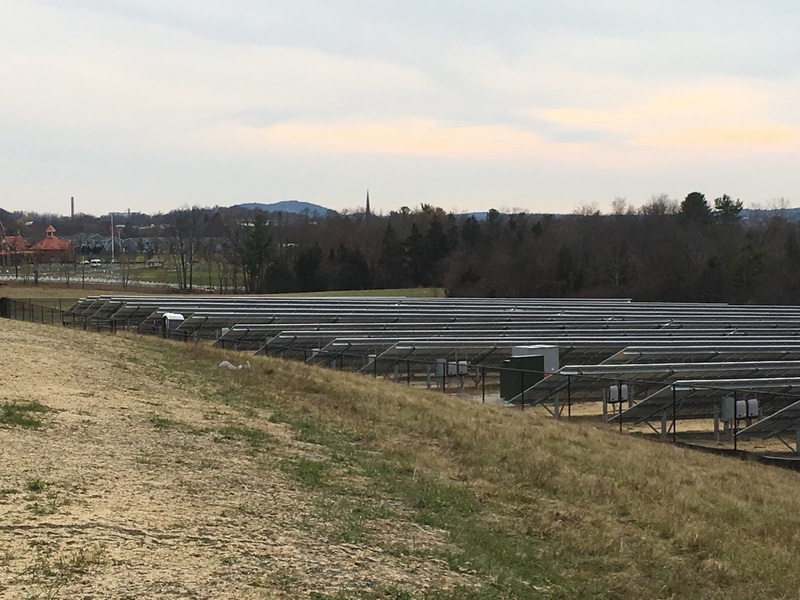 What they were offering was a utility service agreement with the City of Hudson--up to 40 percent of the energy produced would go to the City and the rest to residents. Council president Tom DePietro referred the proposal to the Economic Development Committee, which promised to take it up at its April meeting. On Tuesday evening, East Light Partners were at the Columbia County Board of Supervisors Economic Development Committee meeting, essentially making the same presentation and suggesting that the County might want to be the single customer that takes 40 percent of the energy. There was also talk of a PILOT. Committee member Michael Chameides (Hudson--Third Ward) raised the issue that part of the land they were proposing to use was in a watershed, and he was assured by another committee member that the project would require site plan review by the Greenport Planning Board, and those environmental concerns would be addressed there. The proposed site, which is located within the area outlined in red on the above map, has issues that go beyond being in a watershed. 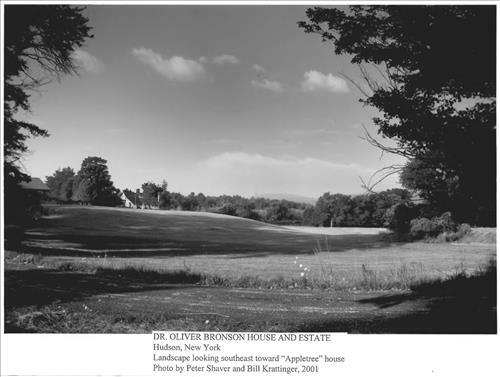 It is next to a prison, yes, but the part of the Hudson Correctional Facility that it abuts is in fact the grounds of the Dr. Oliver Bronson House, and the Dr. Oliver Bronson House and Estate are a National Historic Landmark. The NHL designation encompasses a total of fifty-five acres. The solar array, sited where proposed, would be visible from all three floors of the Bronson House, from various points along the carriage road, and many other places on the estate. 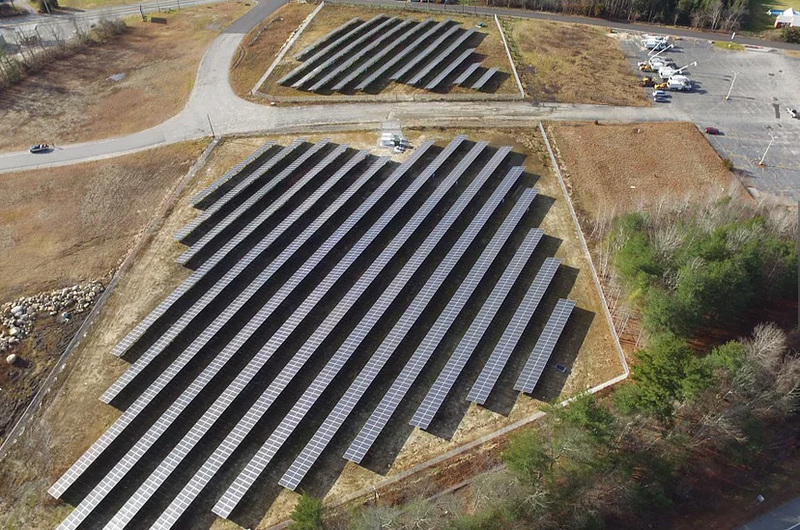 East Light Partners have elsewhere sited solar arrays on landfills. 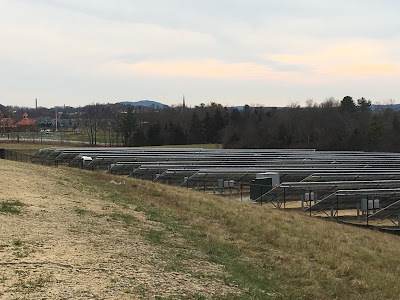 They are currently working on building a solar farm on the town landfill in Saugerties. 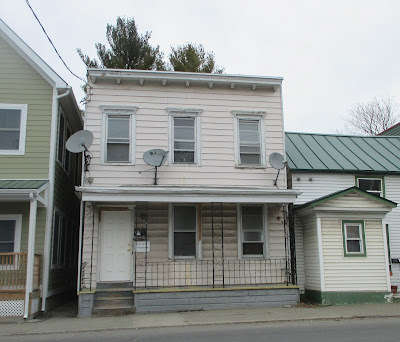 In an article that appeared in the Kingston Freeman, town supervisor Fred Costello is quoted as saying, "That land has never been on the tax rolls; there's no assessment that's applicable because it's the former dump." That's certainly not the case with the land in Greenport that East Light Partners are now proposing as a site for their solar array. Last year, Randall+West, then consultants to the Conservation Advisory Council in preparing its Open Space and Natural Resources Inventory, identified the very area that is the proposed site of the solar array as "Farmland of Statewide Significance." 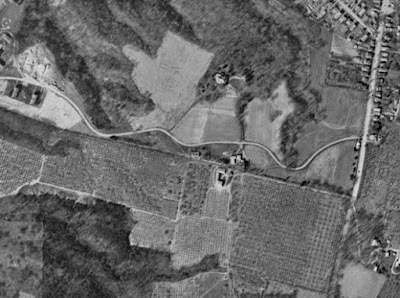 This 1952 aerial photograph shows that in living memory the land was being used for agriculture. This proposed siting seems in conflict with a few of these principles but one most significantly: "protect historic and cultural resources." Not only would the solar array be visible from the Dr. Oliver Bronson House, Hudson's own and only National Historic Landmark, it would also be visible from Olana, whose viewshed has always been scrupulously and robustly defended. The task of denuding 6 West Court Street of anything green and growing, which started this morning, was complete by late this afternoon. 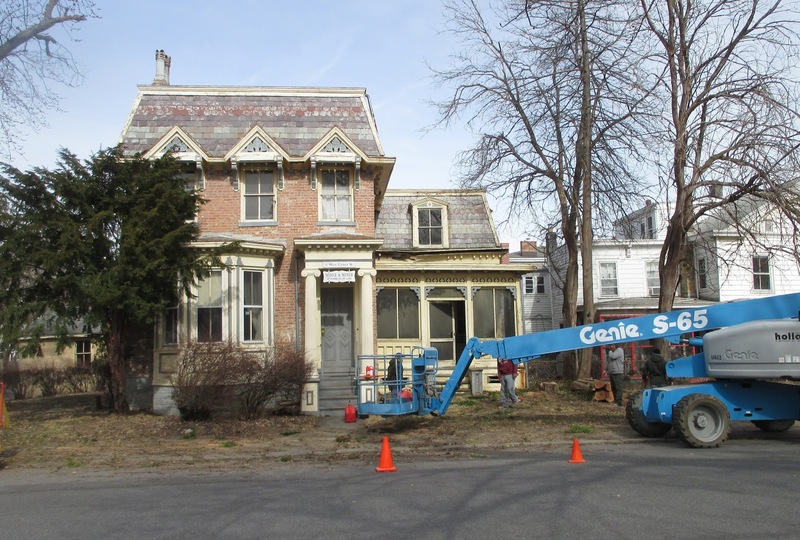 If there was any doubt that the Galvan organization had taken control of 6 West Court Street, it was dispelled this morning, when a crew was spotted there, busy cutting down trees in the front yard. Gossips has learned that the public comment period for Amtrak's proposal to install fencing at various sites along the Hudson River between Rhinebeck and Stuyvesant has been extended. The new deadline for submitting comments to May 1. The Public Works and Parks Committee of the Common Council, shifted from the fourth Wednesday of the month to the third Wednesday of the month and truncated because the third Wednesday of the month is when the ZBA meeting is scheduled, took place last Wednesday, March 21. When it began at 5:30, there was no quorum; only committee chair, Eileen Halloran; public works commissioner, Peter Bujanow; DPW superintendent, Rob Perry; and committee member Rich Volo were present. After a few minutes of uncertainty, though, committee member Shershah Mizan arrived, and the meeting went forward. Here are some things of interest learned at the meeting. The Upper Union Street Green Stormwater Retrofit project is ready to move ahead. Back in December 2015, the City of Hudson received a grant for $248,000 to install "stormwater tree planters to intercept rainfall and prevent it from entering the combined sewer system along Union Street." This was to be a pilot project which would help the City decide "where to install similar green infrastructure practices throughout the community." The bid documents for the controversial Front Street storm water separation project have been submitted to the Department of Environmental Conservation for review. The annual drinking water quality report for 2017 is available and can be viewed here. 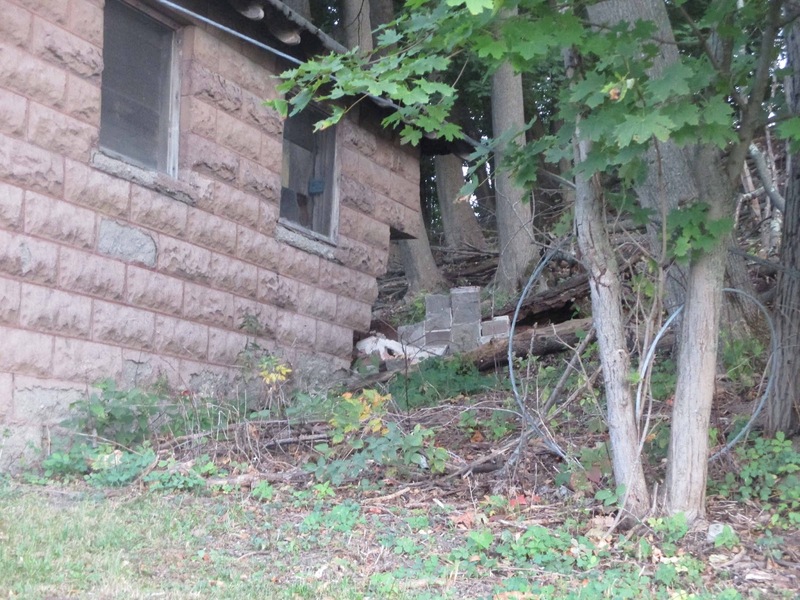 The little building located in what was once the Academy Hill playground has gotten some attention from DPW. Months ago, Gossips reported that the rear corner of the building was crumbling. On Wednesday, Perry told the committee that DPW had "reinforced the [south] wall and framed out the opening with supports, as well as installed a tarp to keep the elements out." 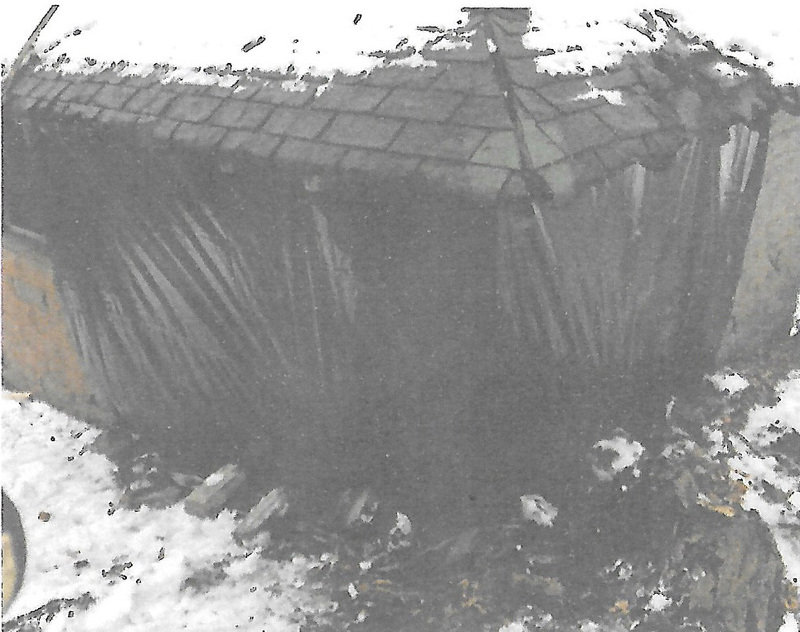 The measures seem to designed to prevent further deterioration, but there was no talk of plans to restore the building. Perry also reported that two documents relating to the Ferry Street bridge--the Bridge Inventory Form and the Phase IA Literature Review and Archeological Sensitivity Assessment--have been submitted to the Department of Transportation for referral to the State Historic Preservation Office (SHPO). 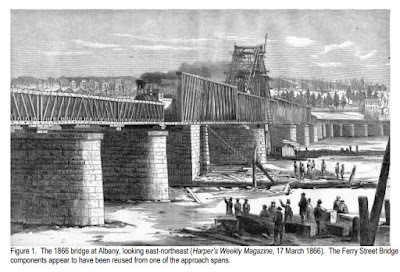 The Bridge Inventory Form makes a rather remarkable revelation: "The original construction documents for [the Ferry Street] bridge indicate that it was fabricated from components taken from the 'Albany Freight Bridge'; the earliest span which crossed the river at Albany, completed in 1866. This bridge was taken down c. 1902, and was replaced by the current bridge, occupying the same site and piers. Images of [the Albany Freight Bridge] suggest that the materials were sourced from the lengthy bridge approaches." Erratum: Now that the little building on Prospect Street is getting some much needed attention and help in surviving, it's as good a time as any to admit that it probably was never a firehouse. The idea that it had been was first suggested by Perry, who spoke of it as a firehouse again on Wednesday. Accepting that as fact, Gossips concluded that it was the firehouse of Fred W. Jones Hose Company No. 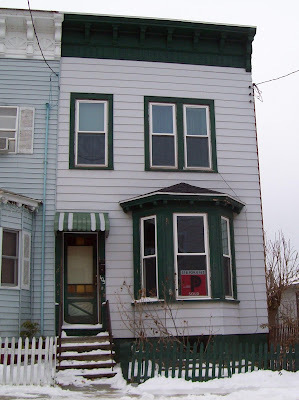 6, which was located on Prospect Avenue. City historian Pat Fenoff has since disabused Gossips of that notion. 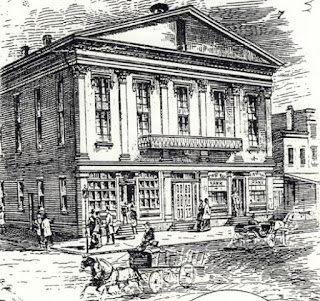 She cited newspaper accounts of meetings that took place in the Jones firehouse, attended by more people than could fit in that little building. She also pointed out that the company is often referred to as "Big Six" and explained it got the name because the company's fire engine was particularly large--too large to fit into the little building in the Academy Hill playground. Fenoff suggested, because the building resembles buildings in the old section of the cemetery, that it may be contemporary with those and constructed for storing maintenance equipment. 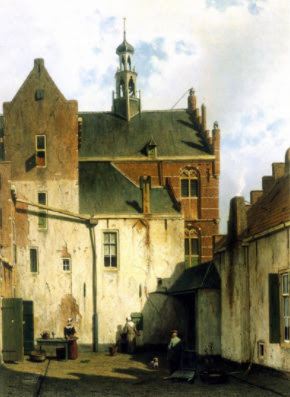 This afternoon at 4 p.m., Historic Hudson and the Columbia County Historical Society present an illustrated lecture by Dutch architect André Hoek entitled A Dutch Approach to Historic Preservation--Preserving "Spirit of Place." 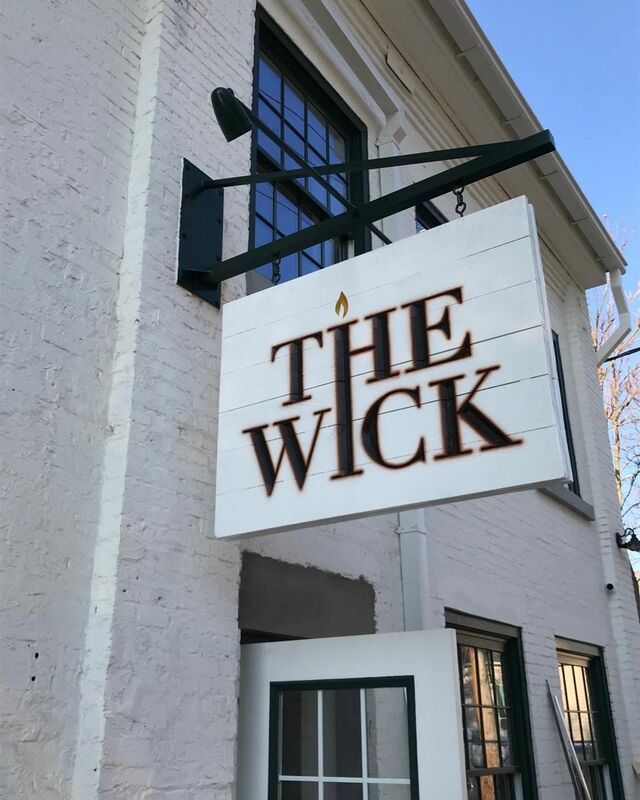 Hoek, who specializes in historic preservation, will speak about the techniques and tools developed in the Netherlands to survey, study, restore, protect, and maintain historic buildings and gardens. He will discuss whether these methods can apply to historic buildings, especially those of Dutch origin, in the Hudson Valley, and he will present the complications of restoring a structure that has been changed and adapted for new uses over time and the challenges of retaining the "Spirit of Place" in historic buildings and landscapes. The lecture takes place at 4 p.m. today at Stair Galleries, 549 Warren Street. Tickets can be purchased at the door or in advance by clicking here. Up until now, Hudson has been featured as a weekend destination--for our historic architecture, shops, restaurants, and quirky vibe, and, last year, for our cultural achievement, when R. B. Schlater's production of The Mother of Us All inaugurated the reopening of the elegantly renovated auditorium at the Hudson Opera House, where, in the 19th century, Susan B. Anthony, the Mother of Us All, had been a featured speaker on three occasions. But, Hudson featured in the New York Times for an academic achievement? This is a first. A New York Times article called Reader Idea | Promoting Literacy With Journalism Education and The New York Times tells how Peter Meyer, professsional journalist and Hudson resident, and his School Life Media initiative are fostering literacy and teaching content and skills through "junior journalism." The article is recommended reading. In September 2017, Mayor Tiffany Martin Hamilton submitted a request to the Zoning Board of Appeals for "a determination of the exact location of the boundaries between the Core Riverfront (C-R) District and the Recreation Conservation (R-C) District" in South Bay. 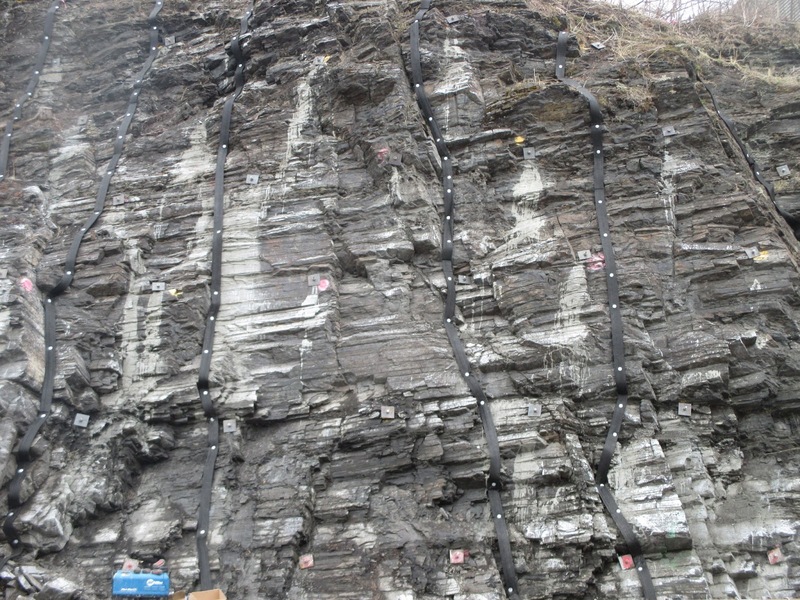 The ZBA assigned the task of determining the exact location of the boundaries to the engineering firm Barton & Loguidice, who studied a number of City documents and submitted their findings in November 2017. At its February meeting, the ZBA got back to considering the mayor's request and the information provided by Barton & Loguidice and announced they would have a public hearing about the issue before making their final determination. That public hearing took place this past Thursday, March 22. Although the benches at City Hall were filled with people, most apparently there for the public hearing, no one seemed to want to speak. 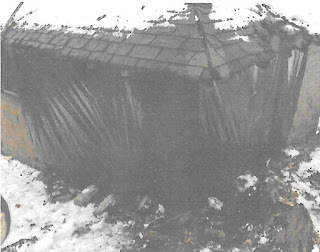 When it seemed the public hearing might close before anyone spoke, I rose to express the opinion that this determination was of great importance and would have significant impact on development at the waterfront and to reiterate what I had said back in November that the information from Barton & Loguidice was incomplete because they had not determined the width of the "tail" of the Core Riverfront District as it makes its way through the Recreational Conservation District. If the width were not established, the boundary between the C-R and R-C districts in South Bay would be fluid. 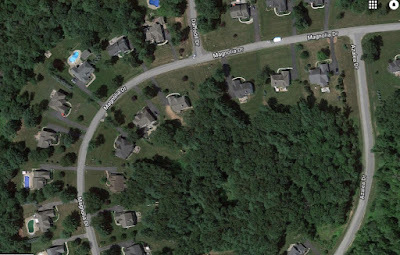 The road could be widened, moved, and could encroach without constraint into the R-C District. After I sat down and ZBA chair Lisa Kenneally asked if there were any other comments, seemingly with the expectation that there were none, Timothy O'Connor swept into the room. On behalf of the South Bay Task Force, O'Connor had submitted by email that afternoon an extensive study of the issue, which represented the group's public comment. 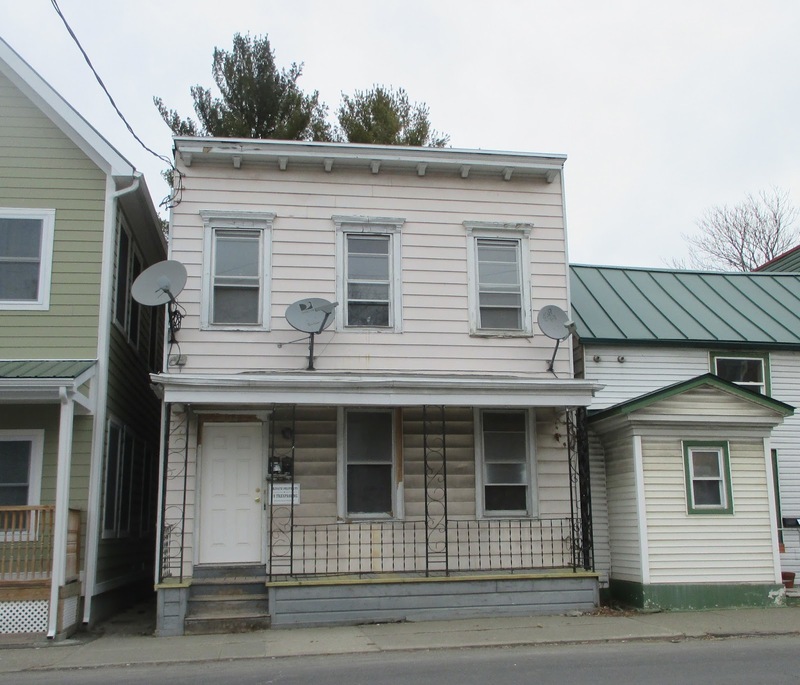 There was some question about whether or not the board would accept written comments and if written comments needed to be submitted ten days before the public hearing just as applications to the ZBA for variances needed submitted ten days before a meeting. When O'Connor argued that he'd been up all night preparing the materials, ZBA member Russ Gibson told him, "You had a whole month." 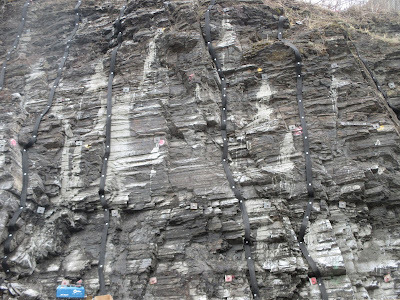 In the end, the ZBA agreed to accept into the record O'Connor's document and a second document, which identified inconsistencies and errors in maps submitted by P. J. Prendergast, the engineer for Colarusso, in the project narrative for the proposed haul road. In his oral comments during the hearing, O'Connor called the determination "the biggest government decision since the St. Lawrence Cement decision" and said it would "put the finishing touch on the zoning for South Bay." 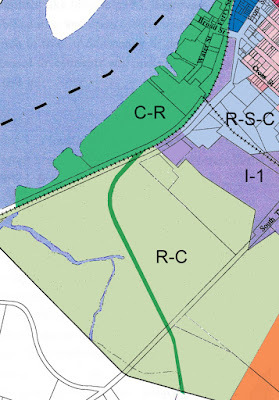 He argued that the terms causeway and road were synonymous and suggested that the width of the road in 2011, when the zoning was adopted, should determine the width of the Core Riverfront District as it extends through the Recreational Conservation District. 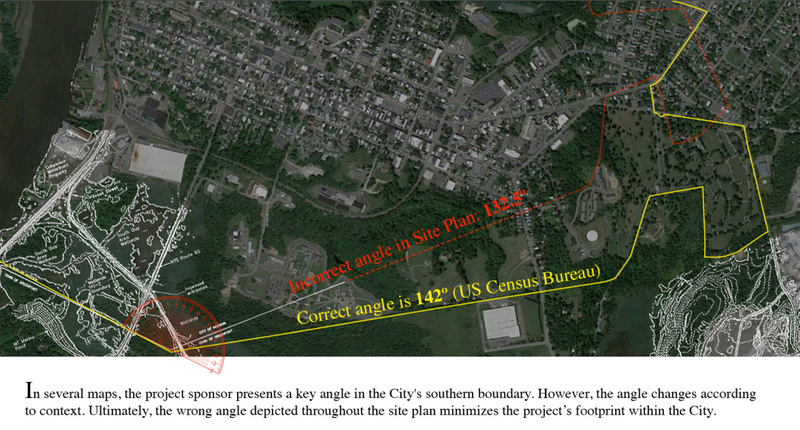 When the public hearing was closed and the ZBA took up its discussion of the boundaries, Kenneally started out by saying, "The task before the board was to define the boundaries, and we agreed that the engineers had defined what we were looking for." ZBA member Steve Dunn disagreed. He argued that the report from Barton & Loguidice was incomplete because it did not address the actual width of the tail through South Bay. He also disagreed with Barton & Loguidice's conclusion about where the tail merges with the larger part of the Core Riverfront District. Dunn presented a memo to his colleagues on the ZBA, outlining his concerns and his conclusions. He asked that the ZBA request permission from the property owner to walk the haul road to "nail down what is the haul road and what is the causeway," but when he made a motion to that effect, no one seconded it. 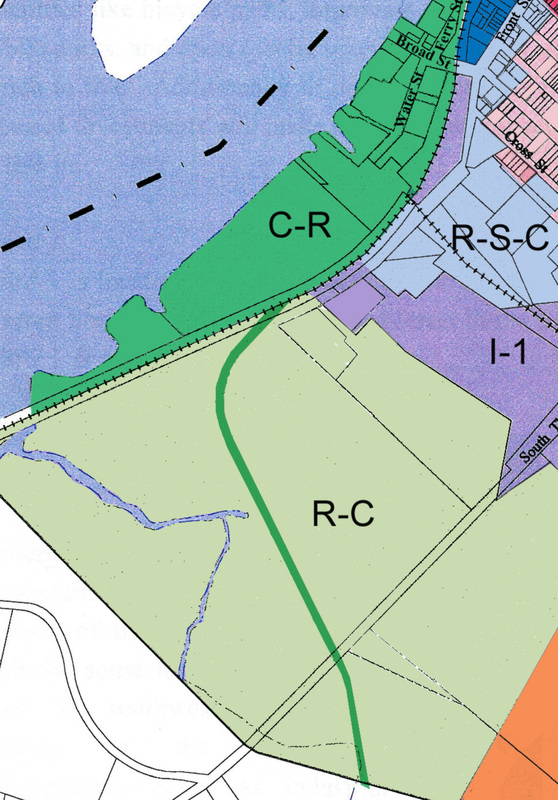 As the discussion of zoning maps and the definition of causeway continued, Kenneally said, "I think we're getting beyond our task" and reiterated that the engineers had defined the boundaries. 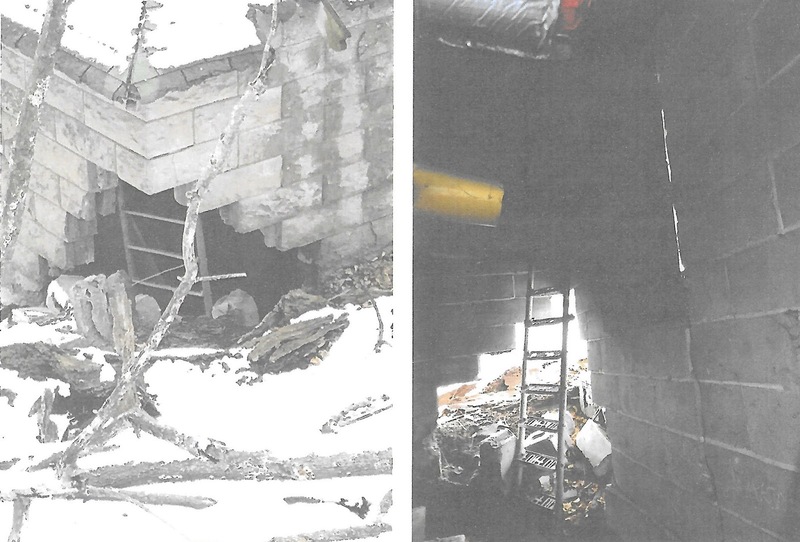 ZBA member Myron Polenberg concurred that the engineers "fulfilled the task they were requested to do." When it was suggested that the board take a month to study the documents submitted by O'Connor and Dunn, Polenberg protested, "Even if we read both documents, how do we remediate? I don't know where to take it from here." Later, Polenberg concluded, "This is beyond our level of competence." After ZBA counsel Mitch Khosrova pointed out to the board, "There is no rush," Kenneally told the board, "I don't have a problem with taking another month." And so, it was decided that the ZBA would table the issue until April to give the members time to study the documents submitted. Some of us have felt a little blindsided by the new roadway that emerges from Hudson High School, at an acute angle from Harry Howard Avenue, right on the border of Hudson and Greenport. The creation of this driveway/two-lane road at the intersection of Harry Howard Avenue (in Hudson) and Joslen Boulevard (in Greenport), transforming that intersection from a three-way stop to a four-way stop, seems as if it should have come before the Hudson Planning Board or the Greenport Planning Board or probably both, but it didn't. Today, it was learned, from the HCSD Capital Project Newsletter, that this "new traffic pattern" was enabled, apparently without any traffic studies or public process, by "a signed letter of approval from the Town of Greenport Highway Department in January 2017 that granted permission for the district to build a new driveway in this location." And then, of course, there's that solar farm. At 6 p.m. tomorrow evening, you may wish you could be three places at once. At Stair Galleries, 549 Warren Street, Katrina and Colin Stair are hosting, from 6 to 8 p.m., the sixth annual fundraising cocktail party to benefit the Hudson Children's Book Festival Literacy Fund. 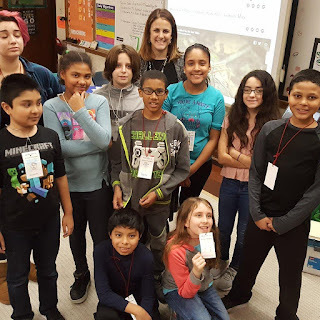 The cocktail party raises money to provide a "Good For" voucher to every student in the Hudson City School District, ensuring that all students can buy the book of their choice from the author of their choice at the Hudson Children's Book Festival on Saturday, May 5. Admission to the party is $50, payable at the door or online at hcbfliteracyfund.com. 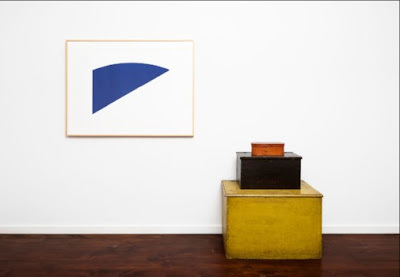 Also 6 p.m., at Jeff Bailey Gallery, 127 Warren Street, there is an opening reception for Line and Curve: The Ellsworth Kelly and Jack Shear Shaker Collection from Shaker Museum|Mount Lebanon with Prints by Ellsworth Kelly. The exhibition, presented by Jeff Bailey Gallery and the Shaker Museum|Mount Lebanon, combines Shaker objects that provide an overview of Shaker design and aesthetic with a selection of iconic Kelly prints from the 1960 through the 1980s. For more information about the exhibition, which continues through May 13, visit the Shaker Museum|Mount Lebanon website. 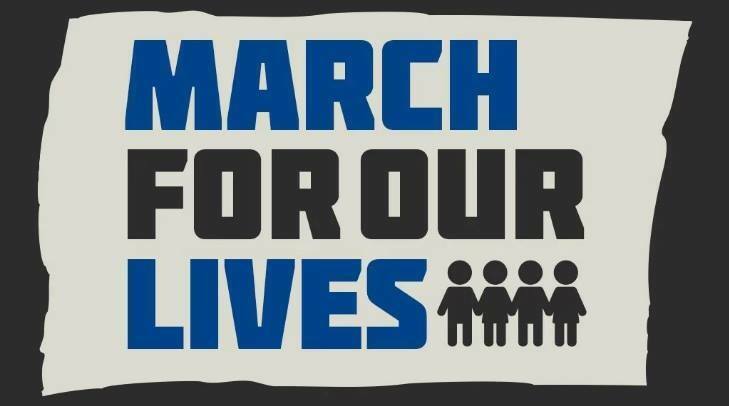 Also at 6 p.m., at Club Helsinki, 405 Columbia Street, Indivisible CD19 NY presents Learn for Our Lives Teach-In, in support of March for Our Lives happening in Washington, D.C., and elsewhere in the country. Speakers representing a broad spectrum of expertise and experience--local students, educators, elected officials, and law enforcement, public health, and faith community leaders--will share their perspectives. All the NY-19 Democratic congressional candidates have been invited to present their positions on combating gun violence. A question-and-answer period will follow the candidates' presentations. Indivisible CD19 NY is a chapter of Indivisible, a national resistance movement that supports local grass roots advocacy. Indivisible CD19 NY is a group of concerned citizens committed to fighting hate, racism, authoritarianism, and corruption in our local area. 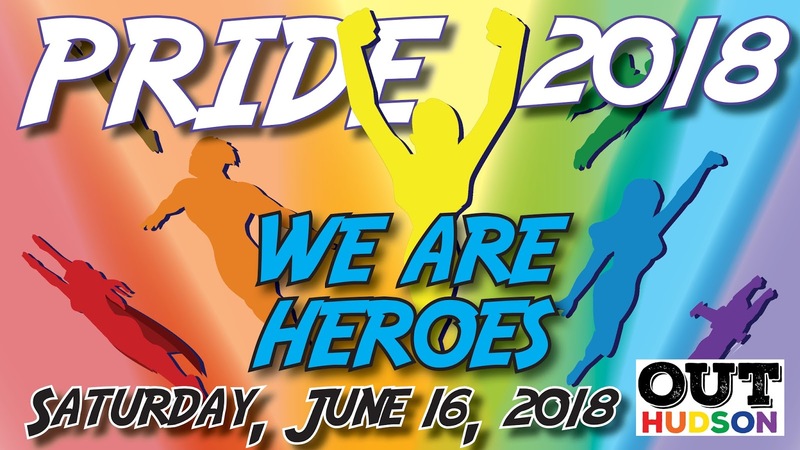 The date and theme for this year's OutHudson Pride Parade has been announced. 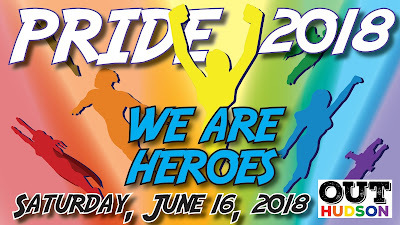 The date is Saturday, June 16, and the theme is Superheroes! You can learn more about the parade and sign up to be a part of it by clicking here. Gossips has been part of the parade since 2012. Here's a hint about the inspiration for this year's Gossips presence in the parade. On Tuesday, the Common Council was supposed to vote on a resolution authorizing the mayor to enter into a contract with Hudson Community Development & Planning Agency to have its executive director, Sheena Salvino, administer the Restore NY grant for the Dunn warehouse. This contract was a long time coming. 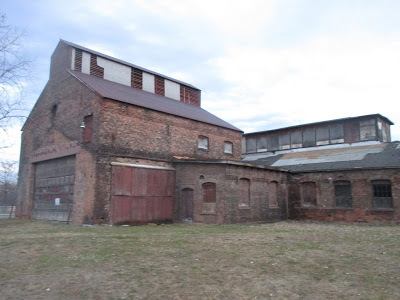 It has been more than a year since the City received the grant to stabilize one of the last 19th-century industrial buildings on Hudson's waterfront. When the resolution came up on the agenda Tuesday night, Council president Tom DePietro announced that the resolution was being tabled, because, as he explained, "the mayor wants to rethink the arrangement." Curious to know what that meant, I asked Mayor Rick Rector, who told me he "wanted additional clarification of the possible issues with the grant as written." That statement reminds us of the concerns raised soon after the grant was announced in January 2017. 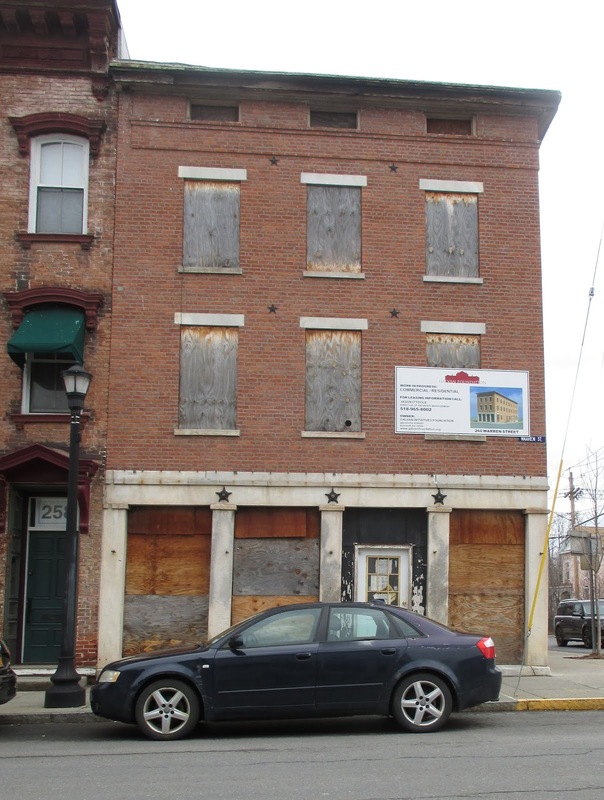 At that time, Rector, who then, as First Ward alderman, chaired the Common Council Economic Development Committee, told the committee he had recently learned that "the grant is tied into a developer with a plan in place." Tabling the resolution suggests that Rector may still be concerned about the grant requiring the City to surrender the building, owned by the City and adjacent to a public park, to a private developer. The adaptive reuse of the building is one of the projects included in Hudson's draft DRI Investment Plan. The DRI request for the project is $1 million. 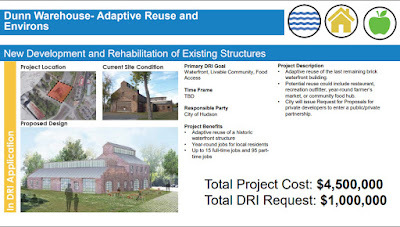 The project abstract states: "The City of Hudson will use DRI funds to stabilize and prepare the Dunn Warehouse for future to-be-determined use." 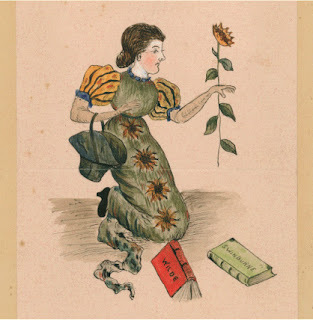 Every year, during Women's History Month, Assemblymember Didi Barrett publishes a booklet called Women's History in the Hudson Valley: Ten Stories from Columbia and Dutchess Counties. This year, the fifth volume of the booklet features two women who spent part of their lives in Hudson: Megan Carr-Wilks, former NYPD officer and 9/11 first responder, and Dawn Langley Simmons, author and civil rights activist. Tomorrow, Friday, March 23, in conjunction with the release of the booklet for 2018, Barrett is hosting a celebration of the life of Megan Carr-Wilks, who died last year from cancer, resulting from prolonged exposure to toxic air at Ground Zero during the September 11, 2001, attacks on the World Trade Center. 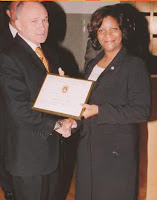 After retiring from the NYPD in 2010, Carr-Wilks moved to Hudson in 2011, where she worked as a school resource officer for the Hudson City School District. At the event tomorrow, family and friends of Carr-Wilks will share stories of her life and her contributions to our community. The event takes place from 4 to 6 p.m. in the community room at the Hudson Area Library, 51 North Fifth Street. The Zoning Board of Appeals public hearing starts at 6 p.m. today. The subject of the public hearing is the determination of the boundary between the C-R (Core Riverfront) and R-C (Recreational Conservation) districts in South Bay. Immediately before the public hearing, the Common Council Public Works and Parks Committee meeting will take place at 5:30 p.m. Ten down and thirty or so more to go. 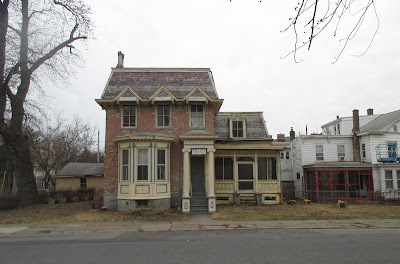 Erratum: Since publishing this post, I heard from Dan Kent, vice president of initiatives for the Galvan Foundation, who informed me that Galvan currently owns only twenty "stabilized uninhabitable vacant buildings which are in predevelopment" not "thirty or so," which was my count.